OF PERFUMERY, COSMETICS, ECT., ECT. 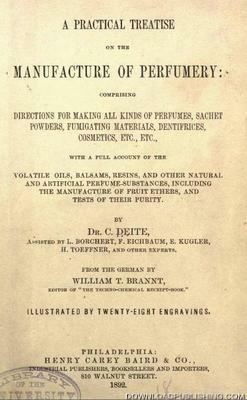 VOLATILE OILS, BALSAMS, RESINS, AND OTHER NATURAL AND ARTIFICIAL PERFUME-SUBSTANCES, INCLUDING THE MANUFACTURE OF FRUIT ETHERS, AND TESTS OF THEIR PURITY. BY Dr. C. Deite - 1892 370 pages. relating to the manufacture of "Fruit Ethers,"
and usefulness of the treatise. easy and prompt of reference.